A new edition of our Work and Organizational Psychology will be published in 2015. Psychologists have been fascinated by the world of work, and the changing relationship between people, technology and the workplace, since the onset of the Industrial Revolution. 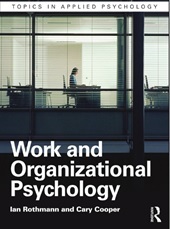 And in providing a complete and contemporary overview of this evolving and fascinating field, the new edition of Work and Organizational Psychology outlines not only the key theoretical ideas, but also how they relate to the role of psychologists advising today’s organizations. The textbook integrates the fields of human resource management and organizational behaviour. The new edition is thoroughly revised to cover new technological advances such as virtual workplaces and virtual employees. In an era of rapid socio-economic change, there is also expanded coverage of the role of workplace diversity, employee commitment and globalization, as well as updated chapters on key concepts such as motivation, leadership, group behaviour and well-being at work. Also including a chapter on career development, the book is supported by a range of pedagogical features, spotlighting issues of theoretical, ethical or contemporary interest, whilst also enabling students to engage in active learning. Lucid and comprehensive, the second edition of Work and Organizational Psychology will be the cornerstone for any student of this dynamic field. Rothmann, S. & Cooper, C.L. (2015). Work and organizational psychology (2nd ed.). Abingdon, United Kingdom: Routledge.